It is the year 1946, and the Nazis are an ever looming threat. As the Allies struggle against the overwhelming tide of fascism, I, Captain William Joseph Blazkowicz, am on a mission to cut the head off the snake. Lead by Wing Commander Fergus Reid and with aid from Private Probst Wyatt III and the rest of our squad, I storm the infamous Castle Wolfenstein in order to assassinate General Deathshead. As the source of the Nazis inexplicably advanced weaponry, ridding the world of his evil would cripple their efforts across the theater of war. At first, all goes well. Fergus's leadership, and my prowess on the battlefield, allow us to make steady advances as our Allied forces distract the enemy. This progress comes at a heavy price, as many of the others in our unit simply don't make it. Ultimately, with just me, Fergus, and Wyatt remaining, Deathshead easily captures us. But simply killing us isn't enough for the depraved sadist. He sees potential in my teammates, Fergus and Wyatt both, for use in his experiments. Unable to choose which one to dissect, this evil man forces me to make that choice for him, or he'll execute all three of us on the spot. Having gotten to know and value the leadership of Commander Reid, and not having as much time to cultivate that same bond with Private Wyatt, I make the grim decision to spare my Commander, leaving an innocent young man to die a needless death. In doing so, I have made a terrible mistake. 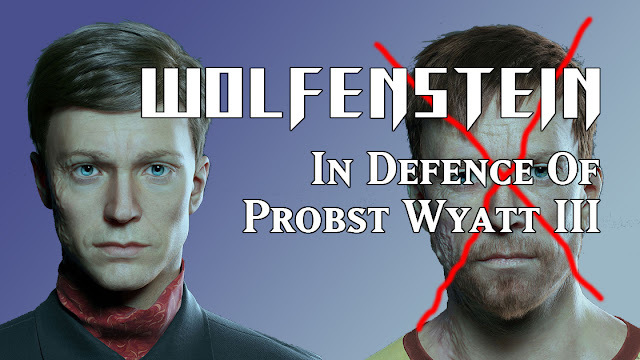 My first playthroughs of both Wolfenstein: The New Order, and it's sequel, The New Colossus, were conducted under the timeline where Probst Wyatt III was sacrificed to the experiments conducted by General Deathshead, leaving Fergus Reid to take a leading role in the Kreisau Circle, the resistance to the Nazi-controlled world government that would reign supreme in light of our failure to assassinate Deathshead. Now, several months after the conversation around The New Colossus ended, I find myself with not a lot coming out. This meant it was the perfect time to make a run of both games, but instead sacrificing Fergus to spare Wyatt, and see what I had missed as a result of my previous choice. Had I known back when I made my first choice what I know now, I would never have sacrificed Wyatt. Out the two timelines, the one where he is spared is superior. One of the ways in which this manifests, even in The New Order, is by the companion character each one of them adds to the resistance in their timelines. In Fergus's timeline, a mathematician/philosopher named Tekla is recruited into the Kreisau Circle. She believes that there is no such thing as free will, that everything is a matter of cause and effect. Her cutscenes discuss this and other philosophical concepts like the conscience and the soul, whether or not they exist, and how/why that would matter. While these are fascinating questions that my inner philosophy student would love to discuss to no end, the answers aren't particular relevant to the thematic content contained within either The New Order or its sequel. In addition, when I sat down to plan out how I would write this piece, arguing in favor of the Wyatt timeline, I found myself completely unable to recall anything about Tekla or her character from my original run of Wolfenstein: The New Order. I didn't even remember her name, relying on Google and YouTube to bring back what was lost in the confines of my mind. That, to me, spoke more about how I must have felt about her back then more than any recollection ever could. But in the Wyatt timeline, she's not there at all. Where Fergus's leadership paves the way for a analyst like Tekla to join the group, Wyatt approaches things differently. Instead, his command brings the guitarist known as J (heavily implied to be this universe's Jimi Hendrix) into the fold. In the interactions between him and Blazkowicz, he brings up points that much more directly relate to the story of a world in which the Nazis won World War 2 and conquered the earth. Namely, when BJ calls out that J has yet to actually take part in any of the fighting, he counters by pointing out the real life hypocrisy of the United States going to war against Nazi Germany when they were also participating in systemic oppression and racism against minorities. In a way, it even foreshadows the direction Machine Games would eventually take the sequel, moving to America and putting a sharper focus on that inherent systemic inequality. It would be unfair to compare my personal memories of J with those of Tekla. Having just played through The New Order in the Wyatt timeline a week ago, of course they are still fresh. That said, when I speak with friends who saved Wyatt way back in their original game, and haven't played since, they still talk about how incredible J is in all of his moments. On top of the aforementioned social commentary, J leaves his mark through the scene where he shares some hallucinogens with BJ and in his death, playing the Star-Spangled Banner at max volume as he is shot by a group of Nazi soldiers. While Tekla struggles to stay with players, J remains memorable long after the game is complete. But beyond having a better supporting character, Wyatt himself is more compelling a character than Fergus. This is easier to talk about in The New Colossus, because that's where the bigger divergences start to happen. Early on in the Fergus timeline, a Nazi general hacks off one of Fergus's arms, which he later gets replaced with a robotic equivalent. Despite being attached to him, the arm has a mind of own, often sabotaging its alleged master. Much of the drama and comedy in the B-plot of this timeline comes from these antics. While I did chuckle more than a couple of times at Fergus’s expense, that subplot doesn't go anywhere and he ends the story in much the same place he was when it began. It felt as if Machine Games didn't know what they wanted to do with his character, which comes in stark contrast to Wyatt. Unlike Fergus, who has always been comfortable taking the lead, Wyatt is both timid and easy-going. In The New Order, and the start of The New Colossus, he has difficulty coping with the fact that people in the resistance look to him for leadership and guidance. Once Caroline, the current head of the Kreisau Circle, is killed, Wyatt nearly has a panic attack as he realizes he's the only one who could be reasonably expected to take charge. In this state, he goes through the belonging he salvaged from J, who had died in The New Order, and started partaking in his... secret stash. This not only does create some of the funniest moments in the game, but also one of the most touching. Towards the end of The New Colossus, after the party scene, Wyatt goes missing. When Blazkowicz finds him, he's in bad shape. Up until that point, we as players don't have many chances to see what Wyatt was like before we first met him. But here, in the grip of the an acid trip, we start to get the full backstory of a young boy whose dad had planned for him to enter politics. A kid who, without a clear idea of what he wanted to do or what he was even good at, joined the military and got swept up in events largely beyond his control. It's hard, at least for me, not to feel a pang of sympathy for the character. Seeing Wyatt and what is clearly a low point makes what happens next all the sweeter. After seizing control of the Nazi's global oversight apparatus and eliminating Frau Engel, the general in charge after General Deathshead is defeated in The New Order, the resistance comes together to broadcast their message to the American people. It's here the Wyatt, this inexperienced and inept kid thrust into a position of authority, finally begins to take up the mantle everyone around him knew he was able to. He delivers a powerful speech on his own, clearly nervous but still comfortable enough to be a leader. (Credit also goes to his voice actor for nailing the perfect balance of emotions for that role.) Where Fergus goes nowhere (and even his version of the speech just has him flailing around at the tail end), Wyatt develops as a person. Though Fergus can certainly get the job done, keeping the story going, he's static. There's nowhere for him to go as a character. Compared to him, Wyatt is a much more flawed and vulnerable human being. Instead of being a weakness, those flaws give him a weight and emotional heft than Fergus cannot hope to reach. They also afford him room to grow, culminating in a resounding resolution for his arc. If you, like me, sided with Fergus on your first run, you owe it to yourself to experience the Wyatt timeline in all its glory. And if you haven't played the new Wolfenstein games at all, get on that.